Here’s one of the first reported crashes of the sporty Aprilia SR150 automatic scooter, and it’s massive. The impact of the crash has split the Aprilia SR150 into two, and luckily the rider of this scooter is said to have escaped with his life. A Tata Tiago hatchback is said to have hit the Aprilia SR 150, resulting in extensive damage to the scooter. After hitting the Aprilia scooter, the Tiago has gone on to collide into an electric pole, and this can be seen in the image above. The driver and passenger airbags of the Tiago have deployed, and the impact on the windscreen shows that the person in the passenger seat of the car may not have been wearing a seatbelt. It’s not clear as to why exactly the Tiago hit the Aprilia. 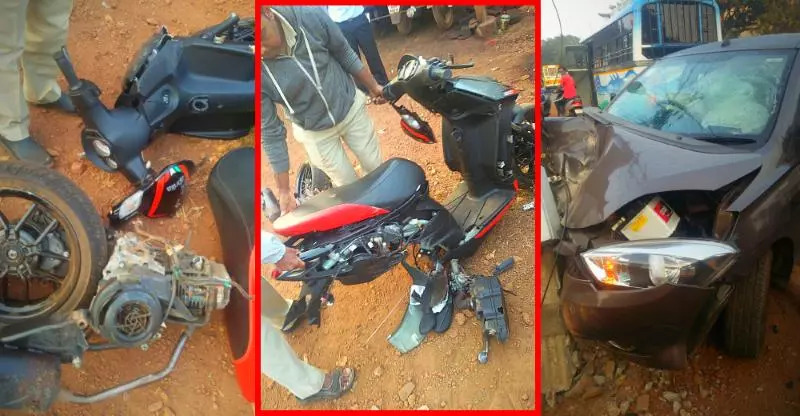 Two wheeler riders are at major risk on the accident-prone roads of India, and a high-quality crash helmet is often the only difference between life and death in case of an accident. So, if you ride any kind of two wheeler, make sure that you wear a good quality crash helmet. The seatbelt is to a car driver/passenger what the helmet is to the two wheeler rider. The seatbelt holds the driver/passenger in place during an accident, making sure that the people inside the car don’t get thrown around inside the vehicle during the accident. Also, the seatbelt restrains the driver/passenger from coming in contact with the airbags, if present in the car. Airbags open with explosive force, and can cause severe burns to people who aren’t wearing seatbelts. In many cars, airbags don’t open when the seatbelt isn’t worn. This is yet another reason why the seatbelt has to be worn at all times.